Sean M. Haffey/Getty ImagesThe Spanos family — owners of the Chargers — are banking on Angelenos warming up to the franchise in the next two decades. 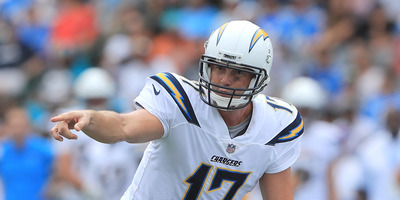 Despite concerns about the team’s “viability in LA” and speculation about the franchise’s next landing spot,NBC Sports’ Mike Florio reports that the Chargers will almost certainly remain in Los Angeles for at least two decades after moving into their new stadium in 2020. Since moving from San Diego to Los Angeles, the Chargers have struggled to fill the stands at the StubHub Center – an incredibly small stadium by NFL standards. Los Angeles brings up the rear of the league in attendance, averaging 25,370 fans at each home game compared to the next-worst average of 53,622. The team plans to drop its revenue goals by 62.5% when it moves into its new stadium in Inglewood, California in 2020, but NFL owners still discussed the Chargers’ “viability in LA” at league meetings this week, according to Seth Wickersham of ESPN The Magazine. Understandably, fans and pundits almost immediately responded to this news by predicting which city the Chargers could call home next, but a report by NBC Sports’ Mike Florio says that the team will almost certainly stay put in the city of angels for at least the next two decades. The Chargers are locked into a 20-year lease at Los Angeles Stadium at Hollywood Park – the construction of which has been funded by Rams owner Stan Kroenke. If the wayward franchise were to pursue opportunities elsewhere, it would not only breach contracts with Kroenke but also with companies investing in sponsorships and advertising at the new venue. Those companies are expecting 20 NFL games a year. Florio also reports that the owners of the Chargers – the Spanos family – have no interest in playing elsewhere. Their costs to transplant the team were limited to $US650 million in relocation fees and considering they secured a piece of the second-largest media market in the country in return, the deal was undoubtedly a bargain. The Spanos family is banking on Angelenos warming up to their franchise in that 20-year span. Considering the city went from having no NFL teams to two in the last two years, it seems likely that football fans in the area will begin to take to their new neighbours in that time. By then, the Chargers will have the option to pick up the first of their two exclusive 10-year extensions at the new stadium.